Grand Bahama Island is one of the few places you are guaranteed to dive with dolphins in the wild. This is done through the Underwater Explorers’ Society’s (UNEXSO) “Dolphin Dive” program, where local dolphins from the Dolphin Experience frolic with divers at a reef about a mile off shore. 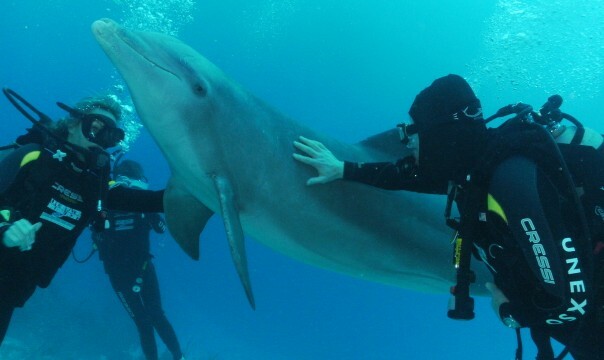 Many people can only imagine getting this close to a dolphin in the wild. Don’t miss out on this rare and amazing experience––swim with them right here on Grand Bahama Island. 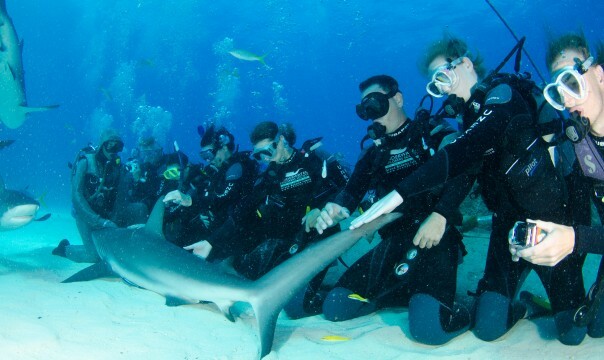 If you want to dive with sharks, there are two feeding programs you can participate in on Grand Bahama Island; one with UNEXSO and another with Xanadu Undersea Adventures. In both programs, an experienced shark feeder wearing chain mail offers fish to a swirling group of Caribbean reef sharks. Anyone who’s done this dive will tell you that it makes for an incredible photo opportunity.! The adventure will typically begin with a... show more detailed briefing at the dock. The shark feeder will run through the various phases of the dive, then you will travel to the dive site together via boat. Once in the water, you will soon be amazed at the sights around you. You will often see 10-25 sharks, varying in length from 4 to 9 feet, many of which will come quite close to the group. Definitely an experience to remember! If you’re an avid diver, you’ll benefit from knowing what some of the most unique and best dive sites are in the areas surrounding Grand Bahama Island. Shallow sites are generally 10 – 15 feet deep. Perfect for snorkeling, beginning divers, fish watching and picture taking. These reefs offer the most colour, fish and coral because of their shallow depths. SPID is an acronym for the Self-contained, Portable, Inflatable Dwelling that was once used for short term habitation experiments in the mid-to-late ‘70s. A twin engine Aztec aircraft, once used in the “Sea Hunt” series, is nestled on the sandy bottom. Large schools of blue parrot fish are often seen grazing on the bottom. As you head south, the coral will become solid with surge channels running through it. This site is very close to the location of the shark dive, so you may see one or two Caribbean reef sharks passing through. Here you find a pretty string of coral heads on a sandy plateau that should be visited as pieces of dfsdsfart in a gallery. On one isolated head, there are star corals of three different colours. Take your time to examine the individual coral heads as you can often find arrow crabs or red banded coral shrimp in their nooks and crannies. Further south, the scattered coral heads become a more solid fringing reef.